Problem: create a drought through weather modification; Reaction: people react in fear; Solution: water meters, water rationing. It’s an Orwellian nightmare come true in California. Please bear in mind, that as Californians are being required to cut back severely on their water usage, the almond growers (who’s crops primarily are sent to China, and Nestle (a foreign company), have no water restrictions, and actually take a HUGE percentage of water in this state. To add insult to injury, Nestle denies that water is a fundamental human right. They used to call it “Global Warming”, when that no longer worked, they renamed it “Climate Change”. Fortunately, I found a list of patents on Geoengineering Watch that have been taken out for weather modification since 1920. This should be proof enough for all naysayers that yes, indeed, there is the technology to alter the weather. Most people are just too afraid to acknowledge it even when they see how profoundly the weather has changed in California, i.e. one day hot, next day cold, winds up to 60+ mph, rain off season, no more seasonal weather, white, funny lines all over the sky. It will be interesting to see just how much the people of California are going to accept when it comes to water rationing. And make no mistake, that is exactly what this is. It will also be interesting to see just how concerned Governor Jerry Brown is for the state of our trees, as people are forced to drastically cut back, thereby allowing their landscapes to die. I guarantee you, people will be more concerned with water usage in the home, rather than the landscape. 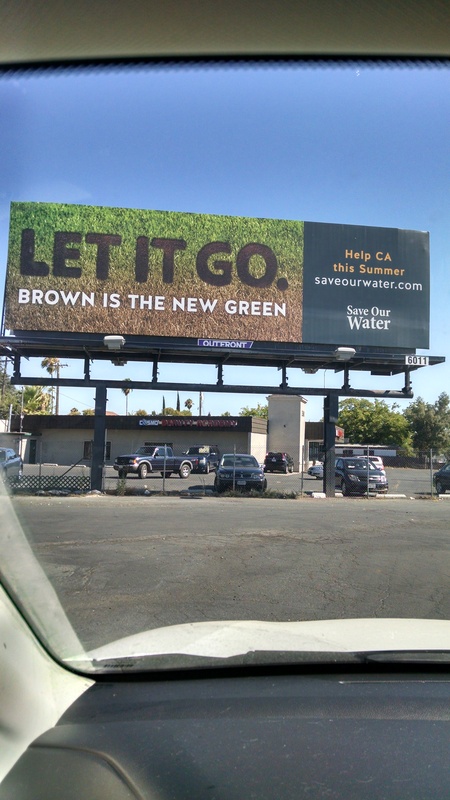 Jerry Brown’s clever motto in 2016 was, “LET IT GO, Brown is the New Green”. Isn’t that a flippant attitude? No concern for anything living; just let it die. “This is bad stuff. It doesn’t get any worse,” Gov. Jerry Brown lamented to scientists, religious and political leaders in Europe ahead of the conference. “The threat is profound. It will alter human civilization. It’s not decades away. It’s closer than you think,” the Democratic governor added later. Rising temperatures reaching a tipping point would cause massive destruction, exacerbating inequality, poverty and migration patterns. The warnings are embedded in the speeches and calls to action by Americans at the conference in Germany. Brown, who has made climate change the central mission of his current stint as governor after serving before from 1975 to 1983, told European leaders that the recent fires in California, stoked by high winds and low humidity, were the latest sign of a planet in the throes of immense changes. Please tell me just how was Jerry Brown able to make such incredible predictions, if he doesn’t already know what’s coming? Could that answer be found in this paper put out by the United States Air Force titled, “Weather as a Force Multiplier, Owning the Weather in 2025“? SACRAMENTO (CBS13) – There will soon be more focus on flushes and scrutiny over showers with a new law signed in by the governor. California is now the first state in the nation to enact tough new water-efficiency standards. The controversial rules limit how many gallons a person can use inside their home per day. “So that everyone in California is at least integrating efficiency into our preparations for climate change,” said Felicia Marcus, Chair of the State Water Resources Control Board. In 2022, the new indoor water standard will be 55 gallons per person, per day. by 2030, it will fall to 50 gallons. Water districts who don’t comply face fines up to $10,000 a day. The ultimate goal is to make conservation a way of life in California. Outdoor water use is also covered by the new laws. In the meantime, in order to cut yourself a little water slack, stick a sign over your toilet that says: “Pee you don’t, poo you do”. That should cut down on flushing.